Today (12 October) Daniel Lingham appeared at Norwich Magistrates’ Court facing five charges contrary to the Wildlife and Countryside Act 1981, relating to the taking and possession of wild bird eggs. He pleaded guilty to all five charges. He is now due for sentencing on 27 November 2018 at Norwich Magistrates’ Court. The court heard how, on 21 May 2018, Norfolk Constabulary were called to Cawston Heath following reports of a man acting suspiciously. The man – Lingham – was located and arrested after being found with nine linnet eggs on his person. The police contacted the RSPB and, following their advice, a search was conducted at Lingham’s home in Newton St Faith. Here nearly 5,000 eggs were found stored and catalogued in wooden trays. The collection included the eggs of some of the UK’s rarest birds such as marsh harriers, and those of greatest conservation concern, like nightjars and turtle doves. They had been taken from Norfolk reserves. Lingham was jailed in 2005 for 10 weeks after police found a collection of almost 4,000 eggs at his home. Mark Thomas, RSPB Senior Investigator, said: “At a time when egg collecting is on the decline, Lingham is the most prolific egg collector in recent years. It’s very rare that an egg collection of this magnitude comes to light these days. PC Tom Pellew and PC Leah Hutchins, both based at Aylsham Police Station, led the investigation. 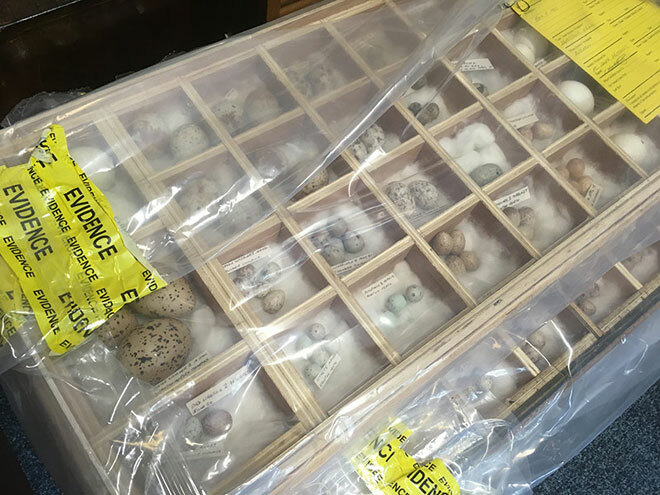 PC Pellew said: “The sheer scale of the collection of eggs that Lingham had in his possession was very worrying with many of the species involved being endangered. “We know that crimes of this nature often go under-reported, which is why cases and convictions like this are so important in raising awareness of such wildlife offences. If you notice any suspicious behaviour around birds’ nests or breeding sites, including people looking in bushes or wading out to islands, often at unsociable hours, please call the police on 101 and RSPB Investigations on 01767 680551.